CyberOne: Law in the Court of Public Opinion » Welcome to Law in the Court of Public Opinion! Welcome to Law in the Court of Public Opinion! Welcome to the course website for Law in the Court of Public Opinion. 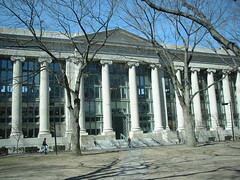 This course is being offered jointly in the Harvard Law School and the Harvard Extension School in the fall semester, 2006. If we do say so ourselves, the course will be unlike any that has ever been taught. It is a course in persuasive, empathic argument in the Internet space. Throughout the course we will be studying many different media technologies to understand how their inherent characteristics and modes of distribution affect the arguments that are made using them. Students will be immersed in this study through project-based assignments in which they will be using these technologies to make their own arguments. For a good introduction to the class, watch this video of a discussion with Charlie and Rebecca hosted by the Berkman Center. Our brief trailer video gives an A/V description of the CyberOne experience. Note: The video requires Quicktime 7 (free). Alternatively, watch the lower quality Flash version. Only Harvard Law students can register for the law school version of this course. Students at other schools of Harvard may enroll by cross-registering according to the rules of their home school. Enrollment to the Harvard Extension School is open to the public. Extension students will experience portions of the class through a virtual world, known as Second Life. Videos, discussions, lectures, and office hours will all take place on Berkman Island. Students from anywhere in the world will be able to interact with one another, in real time. All of our videos and lecture materials will be freely available to anyone with an Internet connection. We’ll also be broadcasting select video on Cambridge Community Television, for residents of Cambridge, Massachusetts. Thank you for using my photograph on your page, but could you please link to ColinGregoryPalmer.net as I request on my flickr page?